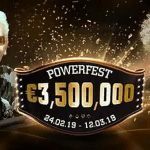 Party Poker´s Powerfest returns on Sunday for its ninth installment with 255 tournaments packed into fifteen days of action and more than $30 million up for grabs. As usual, each event has multiple buy-in levels to accommodate every size of bankroll, plus the site is running a comprehensive satellite schedule that offers a number of opportunities to qualify for the series´ feature events at a fraction of the buy-ins. Also as usual, the schedule offers a good range of NL Hold´em tournament formats from slow-paced, deepstack events to hyper-turbo crapshoots, but sadly no Omaha tournaments. 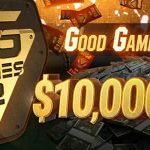 Instead, the site is hosting five “Championship Events” – each awarding a special trophy to commemorate the winner´s achievement – plus fourteen “Powerfest $320” tournaments with prize pools up to $1 million. 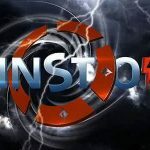 The highlights of the Powerfest series are undoubtedly the Championship Events. Between the five events there is $6.5 million in guaranteed prize pools, and although the buy-ins are a little steep for some players, Party Poker is running special Powerfest Spins games (see below) giving players the chance to win a seat in a Championship event for as little as $5.00. 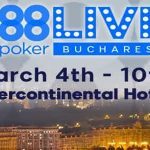 Players without sufficiently deep pockets to support big buy-ins also have their own Main Events to get involved in At the same time as the final two Championship Events get underway, there will also be a $55.00 buy-in PKO 8-Max tournament with a $200,000 guarantee and an $11.00 buy-in tournament with the same format carrying a $50,000 guarantee (neither award winners´ trophies). Although the chance of the top prize being drawn is one-in-a-million, the frequency at which the lower value ticket prizes will be drawn is not that bad. However, one important point to note is that, if you win a Powerfest ticket in the Spins promotion, you have to use it by the 14th April or you will lose it. There are no cash alternatives or exchanges allowed. Will You be a Big Powerfest Winner? Powerfest Spins games and satellites feeding into the opening events of Powerfest IX are already live in the Party Poker client, and the action starts for real this coming Sunday afternoon at 2:30pm with the first round of tournaments guaranteeing $500,000 in prize money. In total, there are twenty-five Powerfest tournaments scheduled for Sunday with more than $3.75 million there to be won. Will you be a big Powerfest winner? Only if you play at Party Poker!